I have to let it dry for a week and then I can take the nails out and play it. I am very excited to hear what it sounds like but I know it will be beautiful because Spirit guided me to make it. I did struggle with making it at the beginning because I was trying to make it perfect. Once I let that idea of perfectionism go and just trusted in Spirit, it actually was pretty easy to make. 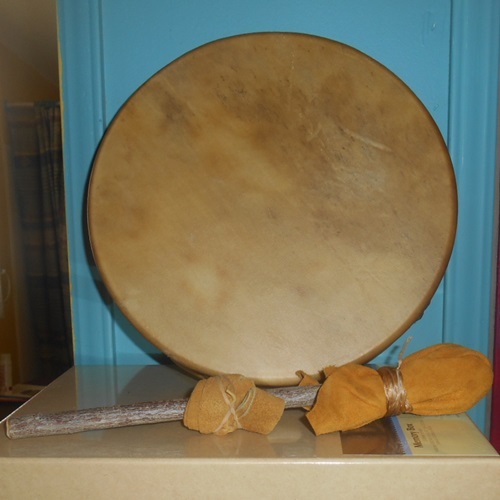 I plan on painting it but I first have to research what will be the best medium to use and will not harm the drum, but enhance it. I am hoping spray paint will work because I already have ideas for how to paint it with that. I also made the beater in the picture which is nice but I think I may go for a walk and find my own stick and gather my own supplies to make me a new one. Until then, though I have this one so once that week is up I can play the drum. I had been searching for a drum but was having trouble finding one that really spoke to me so I hadn’t purchased one. I guess now I know why. When I saw the invite to the drum making meetup, I knew that that is where I was supposed to be. I held him and asked what his name was and he responded with Baltese. I researched a little and found out that Baltese is a fictional town from a book called The Magicians Elephant by Kate DiCamillo. I have never heard of the book but I think I have to check it out now. I will post again in the future once I have the drum painted so you can see how it turned out. Until then I will wait patiently for the next week until I can pick it up and make whatever music my heart guides me to make. Awareness of our perceptions is the first step in creating a different reality than the one we are currently experiencing.